To understand the economy, it helps to have a firm grasp on monetary history. Join me as we examine the last 100 years of monetary policy! The year is 1900 and the Gold Standard Act has just been passed. The Gold Standard Act tied the U.S. dollar to gold at 20$ per ounce. 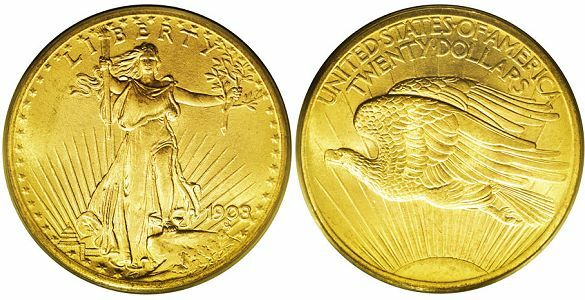 The dollar was "as good as gold" because it was nothing more than a receipt for your gold! This is why older U.S. dollars are referred to as "gold certificates". As you can clearly see, the currency states "This certifies that there have been deposited in the treasury of the United States of America twenty dollars in gold coin payable to the bearer on demand"
1913 - Federal Reserve Act passes, creating the Federal Reserve and ushering in an era of fractional reserve banking! Fractional reserve banking is when you print more receipts for gold than you have gold to back it up. The Federal Reserve was only required to hold a FRACTION of the RESERVES, the reserves being gold. 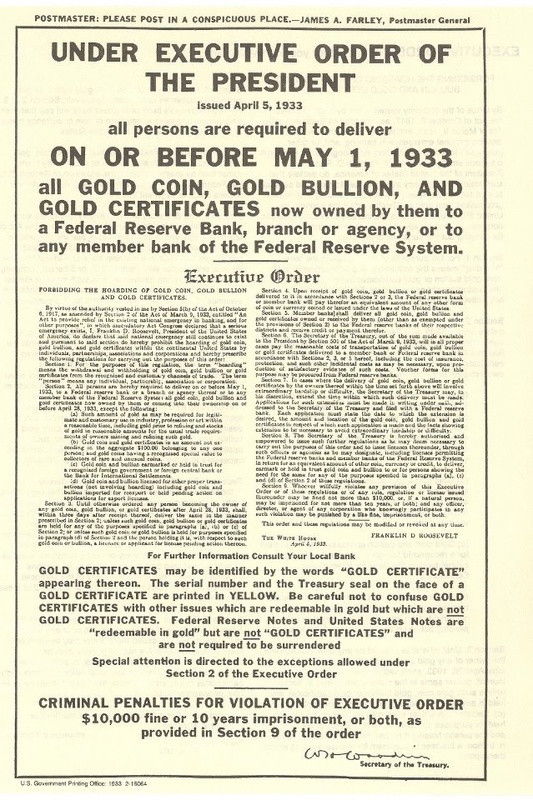 This fraudulent reserve system holds up until 1933 when the market begins to realize that there are far too many receipts for gold, and there is no way the U.S. government has the gold to redeem all the receipts. People run on the U.S. government to redeem their worthless paper for real money (gold). That's right; everyone was required to turn in all of their gold, or go to prison for 10 years. Citizens were given 20$ for every ounce of gold they turned in. The money was still redeemable in gold, just not by you. Now, only foreign and domestic banks could redeem the U.S. Dollar for gold. The very next year, 1934, the government passes the Gold Reserve Act. The Gold Reserve Act devalued the dollar by around 40 percent by raising the exchange to 35$ per ounce of gold. If foreign or domestic banks wanted to exchange their U.S. Dollars for gold, they are going to have to pay 35$ per ounce instead of just 20$. This robbed the American people of about 40 percent of their wealth, prosperity, and purchasing power overnight. This scam continued until 1971 when the government had again committed fraud by printing way more receipts for gold than they actually had in the vault. They had printed so many paper dollars that everyone was again running on the US government to exchange their worthless paper for real money (gold). To this day, the treasury will redeem your 20$ gold certificates for 20 Federal Reserve Notes. Unfortunately, it costs over 1,300 Federal Reserve Notes for a single ounce of gold today. 1971 is the year the U.S. Dollar became a fiat currency. Fiat currency is defined as: "paper money made legal tender by a government decree." This is how the Federal Reserve stole a majority of American’s wealth and gave them worthless paper in exchange, paper that becomes increasingly more worthless every day. This is how the Federal Reserve steals from everyone all at once. This monetary policy has been disastrous. Since the creation of the Federal Reserve, The U.S. Dollar has lost around 95% of its purchasing power. That means that around 95 percent of our wealth and prosperity has been swallowed up by the Fed and redistributed to their friends and cronies. To put it simply: the Federal Reserve creates money, gives it to their friends, their friends become billionaires, and we all pay for it in the form of higher prices. Every dollar the Fed creates robs purchasing power from the dollars that are already in existence (the ones in your pocket). This is simple supply and demand. If there is a surplus of any commodity, it is going to take more and more of that commodity to convince someone to part with their goods or services in exchange for it. When you walk down the street and see a penny, do you pick it up? I don't, because my time and energy is worth more than that commodity. What can I do about this as a State Representative? Unfortunately, as far as legislation is concerned, not very much. Ending the inflation tax is up to you! If each of us can wake up just 2 people a year to the dangers of fiat money, and ask them to do the same, in just 18 years America's entire population would understand how they are being exploited. In the meantime, learn about sound money and seek alternatives to the Federal Reserve Note. Learn about Bitcoin, Litecoin, Dogecoin, and the world of cryptocurrency. Preserve your wealth in firearms, bullion or things of real value. You worked hard for your money, don't let it be stolen from you through inflation. To learn more about monetary policy and the Federal Reserve, please visit our research page! Taxation is theft. As State Representative I will do everything in my power to allow Michigan residents the ability to opt-out of the state's monopoly and seek free market alternatives. Of all the taxes, property tax is one of the most egregious. If you have to pay the government every year to live in your house, you do not own it. Paying property tax means you are just renting your house from the government. I will introduce legislation to implement constitutional carry and eliminate all pistol free zones. Any time there is a monopoly on a good or service, price goes up and quality goes down. Education is too important to be left to the state. The public education system should have to compete for your dollar like any other service provider. No one should be forced to pay for a service they are not using. If you can't get someone to voluntarily exchange their money for your service, chances are your service is obsolete. The wheels of the economy turn in spite of government, not because of it. The free market is a self-regulating system that needs no management or intervention by the state. As Adam Kokesh says: "Government regulations only serve to drive out competition, limit our choices as consumers, and stifle innovation". The War on Drugs has led to increased drug use, excessive incarceration, countless fatalities, and the erosion of civil liberties. Being an addict is its own punishment. Locking nonviolent drug offenders in a cage benefits no one. Socialism, by definition, is when the government owns the means of production. If you support any institution that's managed by the state and funded by mandatory taxation, you're not only an authoritarian, you're also a socialist. However, if you support competitive free markets, voluntary exchanges, private property, and keeping the fruits of your labor; congratulations, you're a capitalist!